Notes: Designed by Randall Kaufmann during the early 1980's. Damsel nymphs are usually 1/2 to 1 inch long with a very streamlined body. They swim with a rhythmic wiggle, that ceases when the nymph needs to rest. During the resting cycle, the nymph slowly drifts downward. Randall noticed that most of the established damselfly nymph patterns at the time lacked the animation that he saw necessary to achieve the lifelike movement of the nymph within the water column. By incorporating Marabou for the tail, body, and wingcase, he succeeded in getting the animated movement of the fly. 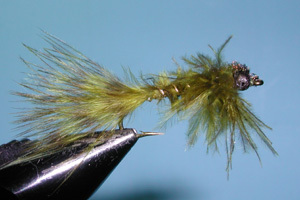 The colors of the marabou are also adaptable to the various colors that damsel nymphs acquire depending upon their environment. Most of these colors are olive, tan, and brown. 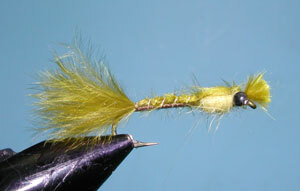 An added benefit to this fly is that number of materials are kept to a minimum and it is easy to tie. Some variations have been adapted to this pattern for specific locations around the Sierras. Notably, the Convict Damsel Nymph by Moose Patterson of Mammoth Lakes. Guide Tom Loe developed a nice variation with his Drifter's Marabou Damsel Nymph and Emerger using a contrasting dubbed thorax and a threaded abdomen.On the nymph, the marabou is secured to the top of the shank, ribbed with the thread to form a shellback, wingcase, and carapace.On the emerger, the tail and abdomen is secured to the the shank by a fine gold wire ribbing. 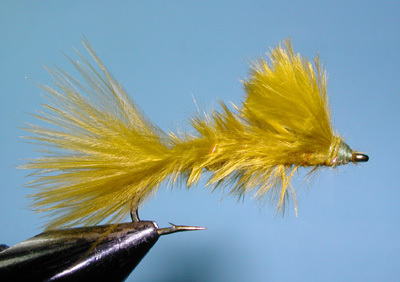 The wing is a second piece of marabou that is secured over the dubbed thorax with the continuation of the gold wire ribbing. 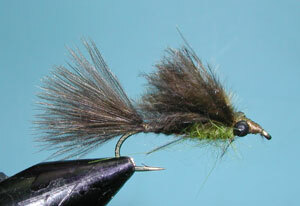 This provides a very durable tie down for the marabou wing. 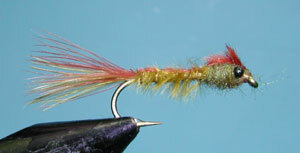 Two other marabou damsels often used within the Sierras are the Damsel in Distress and the No Name Damsel. 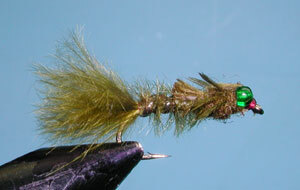 I don't know who came up with these variations but the No Name is marketed by Umpqua Flies of Oregon.